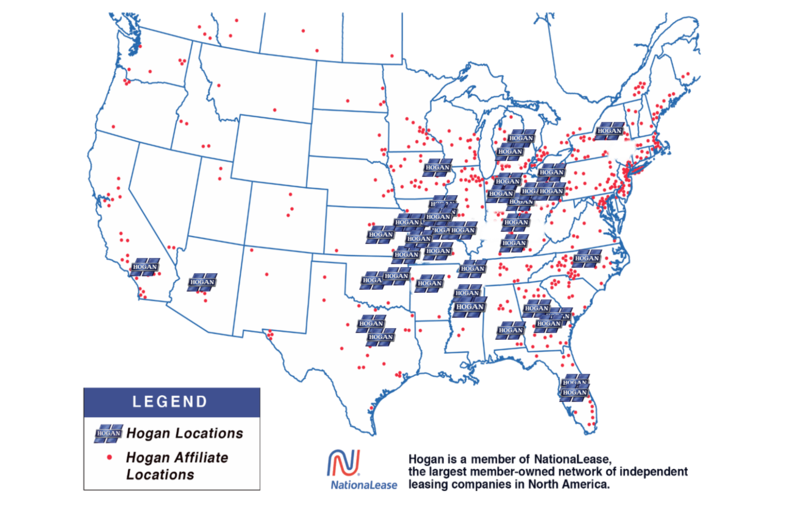 Hogan Truck Leasing delivers comprehensive fleet transportation solutions supported through our nationwide network of 650 company-owned and affiliate service centers strategically located across the US. From cargo vans and straight trucks to sleepers and refrigerated trailers, Hogan offers top-of-the-line equipment and the maintenance facilities needed to operate a dependable, efficient transportation system. From scheduling and continuous driver safety training to administration and recordkeeping, we know how to effectively manage a fleet that provides optimal support for your business. At Hogan, we pride ourselves on providing customized solutions to your transportation needs. Our comprehensive lease solutions cover all aspects of fleet management, including vehicle engineering and acquisition, complete preventive maintenance programs, licensing, permitting and fuel tax reporting. Our nationwide Road Rescue Service assures 24/7 response, replacement vehicles and personal assistance from our own in-house professionals. A trusted, reliable transportation provider since 1918, Hogan understands the transportation industry and the challenges our clients face. Our operating philosophy is centered on providing our clients with excellent service at a fair price and the flexibility to tailor a full service lease solution to their unique needs. Through this approach, we have achieved incredible customer loyalty, enabling us to continue to grow without sacrificing service or reliability.